KOCHI (Kyodo) The head of a clay figure from the late Jomon Period about 2,500 years ago has been found in Tosa, Kochi Prefecture, archaeologists said Friday. The head measures 18 cm, making it one of the largest ever found from the Jomon Period (10,000 B.C. to fourth or fifth century B.C. ), according to the Kochi Prefectural Center of Cultural Properties. The round face features linear eyes and a mouth, which appears to be cast in a smile, it said. Clay figures from this period usually portray women and are believed to have been used as charms for safe childbirth and other purposes. 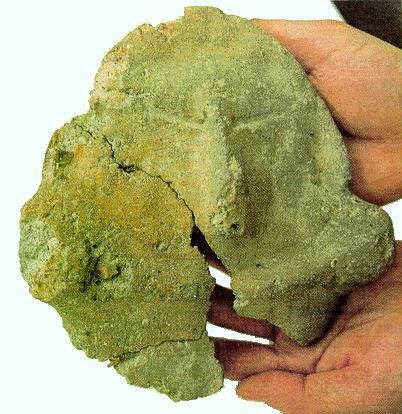 The clay head was unearthed within the Itoku Ruins in an area believed to be a "dumping site," with layers of broken pieces of earthenware and other tools for religious rites of the period. Archaeologists at the center said the clay figure may have been disposed of at the site to end its use as a religious icon. More than 10,000 Jomon clay figures have been discovered across the country, and any figures that measure more than 30 cm are considered large, according to the center. But the latest clay figure may have originally stood as high as 60 cm, in view of the head's size, it said. While only small clay figures have been found in western Japan, the latest find is considered "significant," archaeologists said. The center plans to present a lecture on the clay figure for the public at 2 p.m. Sunday at the ruins.